Wearing the right ski clothing is vitally important to ensure you have a great holiday and to keep safe on the mountain. In extreme circumstances wearing the wrong ski clothing can be life threatening. Jeans are a big mistake - denim holds 5 times its own weight in water (you will almost definitely get wet when skiing) which will then freeze in the cold air. Jeans also take an eternity to dry. Waterproof and breathable ski clothing which is worn in multiple layers is the best approach. Avoid wearing thick clothing as this will not be breathable. Sweat will stay trapped against your skin and you will become very cold very quickly. Thick clothing will also hinder your movement. Thinner breathable items are best worn in layers which will make you warmer and more comfortable. You can also remove layers if necessary and easily store them in a daypack. The materials used are also very important. Cotton holds moisture and eventually makes you cold and takes ages to dry once it is wet. Base layers (which are next to your skin) should be made of a material that has good wicking properties to take away your body moisture. Wool from the Merino sheep is the best natural fibre but there are plenty of synthetic fabrics that also wick well and dry quickly. The outer layers need to be waterproof otherwise you will be wet and miserable. More expensive clothing is often windproof as well which goes a long way to keeping you warm. SOCKS. Do not be fooled. Thick socks are not the warmest. Thick socks hold all the moisture from your feet and eventually make your feet feel like ice blocks. They also tend to rub and cause blisters and discomfort. 'Shin bang' or calf problems will be made worse with thick socks - don't buy them. Good quality, close fitting wicking socks are recommended. They may cost a bit more but the money will be well spent. Smartwool or Falke are great brands to look out for. BASE LAYER. Fairly tight fitting thermal underwear that wicks well and will keeps you dry. You can get them in various thicknesses depending on how much you feel the cold and you can get tops and bottoms. Loose fitting thermals will not work as well. We can recommend Icebreaker as a great brand. INSULATING LAYERS. This is where you get your warmth from and can be as many or as few layers as you wish. Comfortable, thin fleeces or sweaters are ideal, easily stored if removed. Thicker items such as micro down jackets or synthetic fibre gillets are brilliant insulators for people who feel the cold. They are light weight and very packable but provide lots of warmth and are recommend for those of you who suffer in the cold. They can be worn over other insulating layers also. Patagonia’s Nano Puff or Rab’s microlite are recommended. OUTER LAYER. Waterproof and breathable materials are essential for obvious reasons and these will keep you warm and dry. Brands like Gore-tex are great and the tougher pro shells are often fully windproof. If you wear a pack then more durable fabrics are recommended. The outer layer does not need to be mega thick and insulated as you could over-heat and won't be able to shed layers to cool down. The warmth comes from the insulating layers below not from the outer layer. 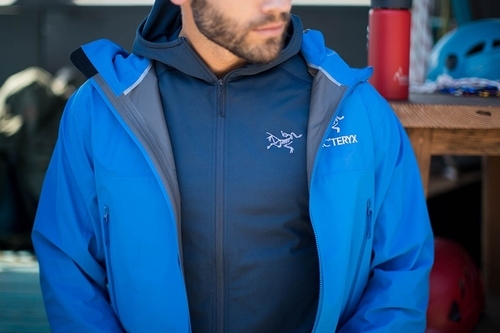 Arc’teryx make some brilliant outer shells and are highly recommended. HAT and GLOVES. There is a common theme here, waterproof and breathable. If you snowboard it is important to get decent warm gloves as you your hands will be in contact with the snow a lot when snowboarding. If you follow the above steps you will be fine on the mountain. In warm conditions make sure you have sun cream and go with a three layer system. Base layer, then a t-shirt and then the outer layer. In cold conditions layer up depending on how cold it is. If it is mega cold like in Japan or parts of Canada take spare layers with you just in case. Better safe than sorry!! When buying clothing in the shop make sure you wear appropriate clothing. For example if you are buying an outer layer jacket put on a few base under layers to make sure the outer jacket still fits. Even if you’re buying in the summer sales dress as you would for a cold ski day in January. Get breathable gloves and dry them after each day's skiing – smelly gloves are never nice. Take more than one pair of ski socks for a week's skiing or snowboarding. Outer layers with vents can be a good idea if you are skiing later in the season. Buy the most luminous and outrageous coloured clothing you can handle. You can be seen from a distance, and besides, wearing lurid colours on the slopes seems to be the current thing. Make sure there is no gap between your helmet and the top of your goggles. This 'punter gap' can lead to painful sunburn and also looks ridiculous.